Me and making sweets? God! Wonder what got into me for a change (Kuih Buah Melaka, Mango Cheesecake & Lemon Buttermilk Cake). Must be the Deepavali,, Diwali or Festival Of Lights spirit. Or maybe since I had some semolina or rava in stock, I thought I might as well. I might as well use it up (Sujee Cake & Rava Kesari) and the type of sweet that popped up on my mind was Rava Laddu, also known or spelled as Ladoo. 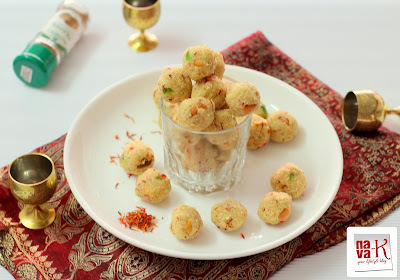 Rava Laddu? Round sweet rava made and ghee loaded and scented by cardamom and mine as you have already noted, are the small, cute adorable ones instead of huge balls which by far are such a waste. I mean, honestly, tell me, can we like finish off the one huge ball? Seriously, I can't understand why people make big laddu balls? I think these people don't understand the concept to wasting or they must be rich until they can't less about whether laddu is eaten or after taking a few bites, thrown. 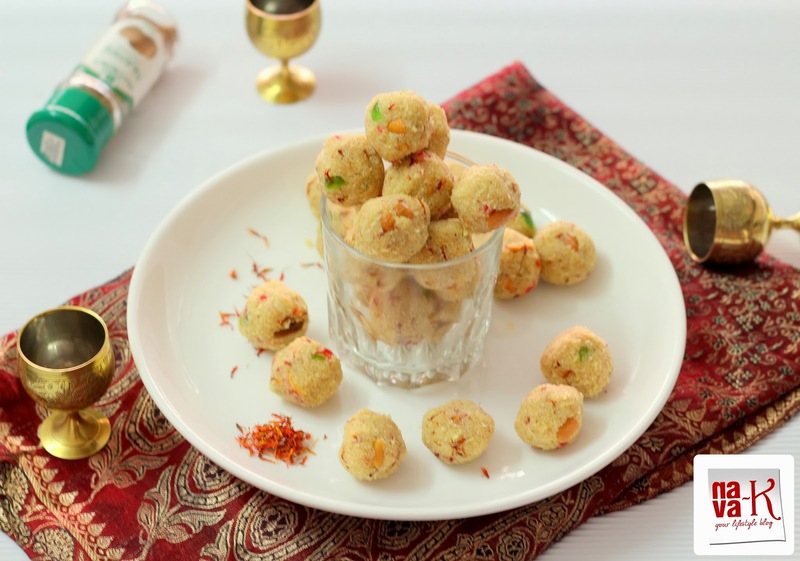 Rava Laddu by the way, definitely is a sugar rush pleasure amongst Indians and without laddu, Indian festivals are not complete. Heat ghee and fry cashew nuts till crispy and brown in color. Stir and cook over low heat until they become brown. Add sugar and saffron strands, continue to stir for another 3 mins. Remove from heat and pour milk while mixing. Lastly add nutmeg and cherries. Pinch the mixture and roll into balls. I have never try this before. In fact, I must admit that I have not heard of this. They look so delicious, Nava! I'll be including this on my list of not-so-sweet sweets. :) Lovely clicks! These cutie ladies look yummy. It looks delicious .Colorful rava ladoo.Take care of your health nava. 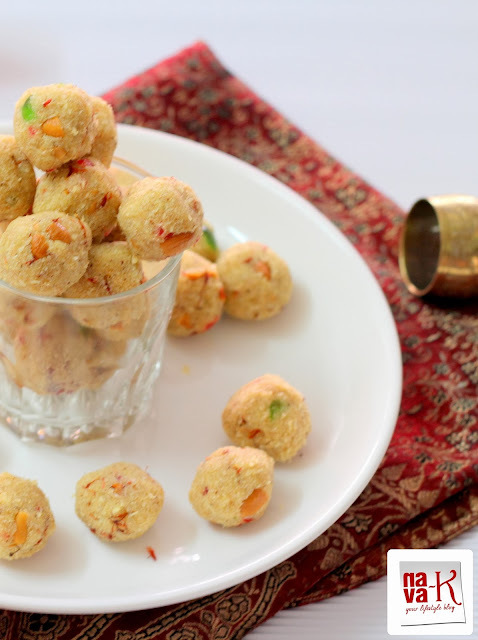 looks yummy..i am goin to make it soon..
laddos looks so cute, I like this size ladoos so I can control my portion, going to try soon. Wow Nava!! Perfect Diwali recipe!! Adding green cherries is new to me.. Looks so colorful..Kids will surely love these balls.. I am also busy cleaning and preparing for Diwali..
Wow , Love those Ladoos , Would love to grab one ladoo now . 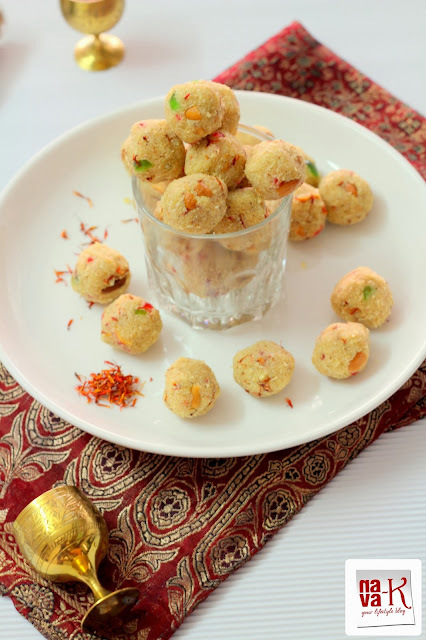 Delicious ladoos Nava! Yes, I am quite busy with Diwali celebrations too mainly getting all the sweets done. Ghee is a must in Indian sweets, isn't it! It doesn't come cheap here but really can't do without it. I love the bite sized portion of these ladoos. They look so cute and yummy ! I love the clicks and the presentation too ! Me encantan se ven muy deliciosos,abrazos. Perfectly done, I do it without milk.